But what about the quality of the benefits UCF offers? 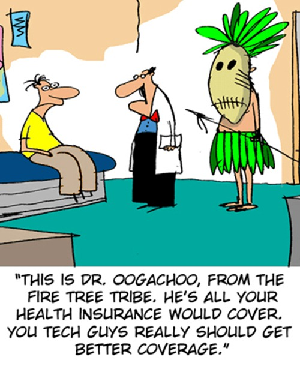 Just offering a plan is not enough … not all medical or dental plans offer the same types of coverage. Are the quality of UCF teacher benefits higher or lower than those offered by other employers? The Collective Bargaining Agreement requires UCF to provide specific medical plan options our classroom teachers. Those plans are summarized here. 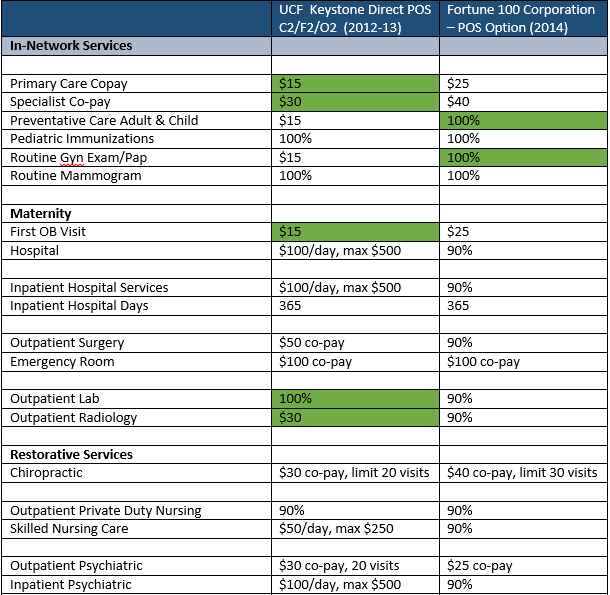 Since I was unable to find a benchmark in the public domain, I compared the UCF medical plan (POS option) against the POS option at my own company. As a very large employer, my company has a very competitive benefits package, typical of the large companies in our area like DuPont, Astra Zeneca, Vanguard, Capital One, or IBM. For in-network service, the UCF plan (first column in the table below) has a few small advantages, but is basically equivalent to a good large-employer medical plan (second column). Advantages of one plan over the other are highlighted in green. For out-of-network services, the large company plan pays a larger share of costs and has lower deductibles, but also has no cap on annual copays. Conclusion: The UCF medical plan for classroom teachers is a very good plan, similar in quality and coverage to plans for professionals in large, non-union private sector corporations. Conclusion: The UCF dental plan has better coverage and quality than standard large company plans. The UCF vision plan is a reimbursement benefit which covers 100% of the cost of an eye exam, 100% of frames & lenses, once every 24 months. This vision plan is typical of companies that have vision plans, including my own employer. Conclusion: The UCF vision plan is similar in quality and coverage to other vision plans. UCF’s plan replaces 66% of an employee’s income for 24 months, following a 6o day elimination period. Disability can be the result of accident, sickness, or mental illness. Payouts are capped at $3,500 per month. For those companies that offer disability income protection, most plans place no limits on duration, and no do not cap payouts. Most employer plans offer a 40%, 50%, or 60% income replacement option. So UCF’s plan does not protect well against long-term disability risks. UCF’s disability income protection coverage quality is below average. UCF’s life insurance coverage is fixed at $25,000 per employee. For employers that offer life insurance coverage, the average coverage amount is 1.4X annual salary, which would be approximately $100,000 in coverage for UCF teachers. UCF’s life insurance coverage quality is significantly below average. If we compare UCF benefits to those offered at a Fortune 100 company, we find teacher benefits are of similar quality overall. Disability and life insurance coverage is weaker than at most companies. The dental plan is better. And the medical and prescription drug plans are of similar quality. Because benefits are of a high quality at Fortune 100 companies, this tells us that overall, UCF benefits are very competitive with the wider market. UCF plans for disability income protection and life insurance have less coverage than typical plans at large companies. Do you have any additional information about the quality of UCF benefit plans? Leave a comment!